The Gauntlet Re-Cap - 09 Rebels WIN!! The 09 Rebels won their division. They were undefeated on the weekend, defeated the 09 Renegades in the Semi final and went on to beat the Eastside Bulldogs 4-3 to win it! Great job by all of the KVHA teams this weekend! Thank you to all who took the opportunity to vote for the KVHA Board of Directors. This past Monday night, Four (4) members were elected to the KVHA Board of Directors. We are pleased to announce Michele Mostek, Michael Wainwright, Tom Miller and Scott Peffer as KVHA Executive Board Members. It is the work of these volunteers that make our association run. We have one of the largest hockey associations in the country and their investment of time, energy, and passion for the sport should be appreciated. The new board will be meeting in the coming weeks to assign specific, functional areas of responsibility, as well as implement committees to carry out the duties of managing the association and positioning KVHA for future growth and development. Special Appointees to the KVHA Board will also be named in the near future. If you have an interest in volunteering, please contact anyone on the KVHA Board or the KVHA office. Feel free to join us at our next board meeting! We encourage member participation in all of our Board meetings, which are held the 3rd Monday of each month at 7:30pm in the Board room at KVIH (inside the South Rink above the stands on the East wall). A huge thanks to all of our coaches and managers for their focus on the development of our kids, not only as hockey players but as successful young men and women out in the world. You make the season special for our players and families and we are grateful for the time, dedication and effort you put forth. Thank you to all of the players for their love of the game, their sportsmanship and the effort they give to their teams. Finally, thank you to all of our parents, for the sacrifices you make for your kids to play, the time you spend at the rink & for all of your support, not just for your child's team, but the entire association. We look forward to seeing everyone back for another great season of KV Hockey this Fall! Registration for the 2019-2020 season will open June 1st! The 07 Raiders followed up their strong February by winning the 2007 PeeWee A Smythe playoffs. After earning the number one seed in Championship Weekend, the Raiders beat the USA Eagles 5-2 in the Saturday semi-final. The Raiders raised the banner with a tight 3-2 win over the Novi Firecats. Way to go on a great finish! Our 06 Renegades capped off a great season as LCAHL Pee Wee AA Norris Champions in an exciting 4-3 win in OT against Lansing. Way to go boys!!!! Our Ravens Tier 2 program had entries at the 10U, 12U, 16U and 19U divisions this season. Our 10U Ravens defeated Honeybaked 4-1 in the finals to bring home the Championship. 12U Ravens Blue went undefeated the entire weekend. They defeated Saint Clair Shores 4- in the finals to bring home the Championship. 16U Ravens won 3 of their 5 games and made it to the finals but were defeated by Little Caesars 4-2. Our 19Us went undefeated to the semi finals, but were defeated by Honeybaked in a close one, 4-3. We are proud of all of our girls on a great season and a great weekend of hockey! 06 Raiders Big Thaw Tournament Champions! 04 Rebels Smokey Mountain Shootout Champions! Markin came to the United States in April 2007 from the mountains of the Dominican Republic. He spoke no English and never saw snow and ice. After seeing one of his older brothers play at KVHA, Markin wanted to play hockey. He started as a second year Squirt three years, playing forward and learning how to stop. As first year PeeWee, he enjoyed attacking the puck and occasionally the person. This season, Markin willingly and with commitment, offered to enter net for the Pee Wee Admirals late in the season. He courageously learned the rudimentary skills necessary to defend the goal. Markin accomplished his first shut out of his nascent career in February. Markin plans to develop his goal tending skills and looks forward to one day taking an exhibition team to the Dominican Republic. A big Markin thanks goes out to all of his past coaches and teammates, especially to this year’s PeeWee Admirals! Austin Strong was born in Plano Texas in 2005, and is in the 5th grade at Maltby Elementary School. Austin had never watched hockey, never wore ice skates or roller skates, until the summer of 2011, when he came home from school and said “I want to play hockey”. Austin had tried several other sports and never really showed a passion, the way he does for hockey. He would much rather be on the ice than playing video games, and is always asking his parents to take him skating. On March 18th, in the KV Pee Wee House Playoffs, with his team down 3 to 2, with less than 3 minutes to go, Austin scored his first hockey goal of his young career. Austin’s goal was the eventual game tying score that allowed his Admiral’s team to collect a critical playoff point in the round robin series. A big Austin thanks goes out to all of his Admiral Teammates, Parents and Coaches. Former KVHA player to play at Boston College!! Haley McLean, who played at KVHA from 2001-2006, has committed to Boston College for the fall of 2013 Season. Haley is in her junior year at Brighton High School and currently plays for the Honeybaked 19U team. She has been with the Honeybaked girl’s organization for the past 5 seasons, helping her team capture the 2012 State Championship and the 16U National Championship in 2010. Haley is also a student coach for the Ravens girls program during the spring season and started her hockey career with the Kensington Valley Hockey Association. Congratulations and good luck to Haley! Joel L'Esperance, a former KVHA hockey player has committed to Michigan Tech University. Joel, a 1995 birth year and coached by KVHA Coach Tommy Miller, started at the KVHA as a Mini-Mite and played all the way through Bantam A. The next year, the team moved to Compuware where they were highly competitive in the elite AAA league. Joel's work ethic and perseverance has moved him to the next level of hockey. Joel will likely be playing for the Des Moines Buccaneers (USHL) before moving to Houghton to join the Michigan Tech Division I Varsity Team. The L'Esperance family would like to thank Tommy Miller for all his efforts in developing Joel through the years. The KVHA would like to wish Joel the best of luck in his hockey future. 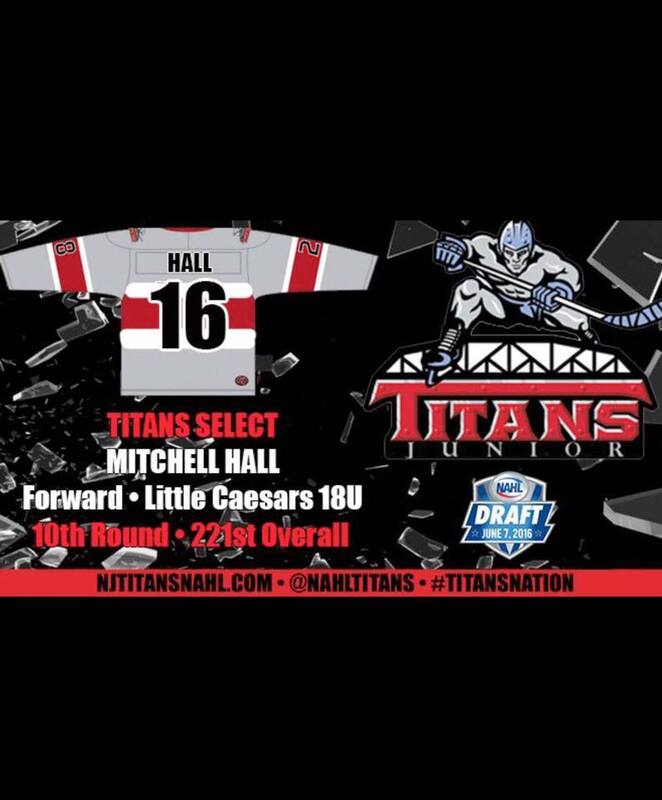 NAHL New Jersey Titans Draft Mitch Hall!!!! KVHA would like to congratulate Mitch Hall, son of Tekla and current 16u Ravens Coach, Tom Hall! Ron Skarzynski, Bob Harde, Gil Odoherty, Kurt Heier, Nelson Turnage, Dan Gardiner, Joe McPhail, Mike Garner and Rob Toth. One of Mitch's favorite memories at KV was scoring the game winning goal over Allen Park to win Silver Sticks. Please join KVHA in wishing Mitch the best in his next hockey endeavor.